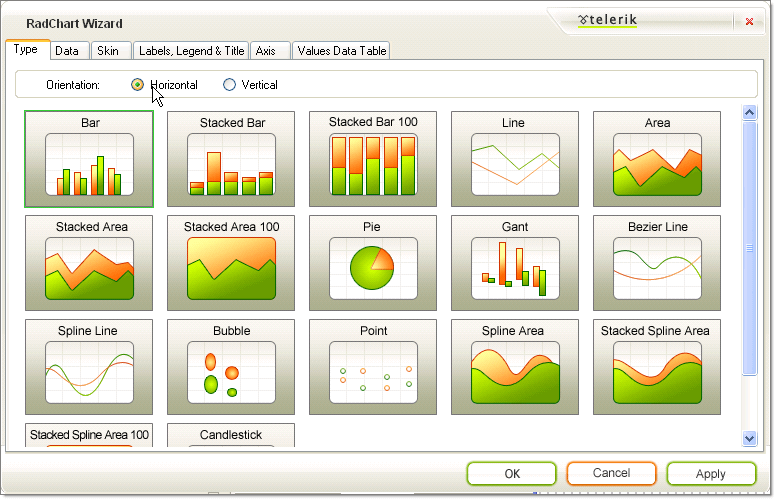 This Quick Start tutorial is designed to have you quickly up and running with a working data bound RadChart. 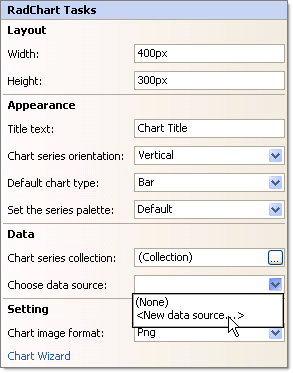 In the tutorial you will populate the chart by binding to a data source and will modify several properties that affect chart appearance. 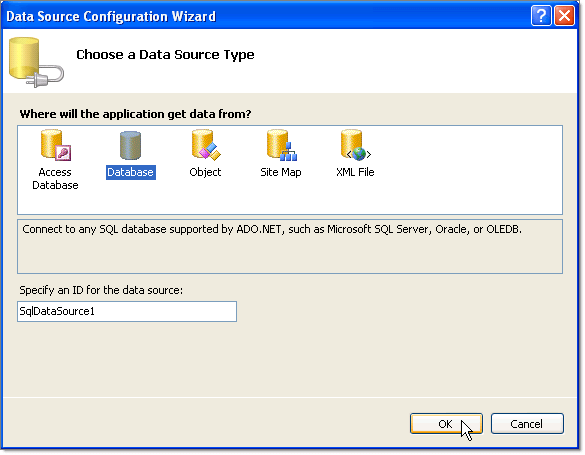 On the Data Source Configuration Wizard page select Database and click the Next button. On the Choose Your Data Connection page click the New Connection button. This will display the Add Connection. 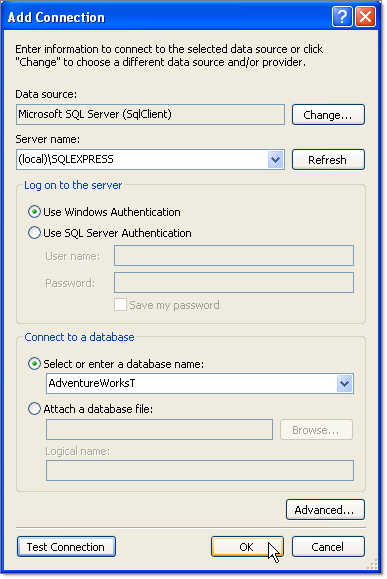 Enter "(local)\SQLEXPRESS" in the Server name drop down list. 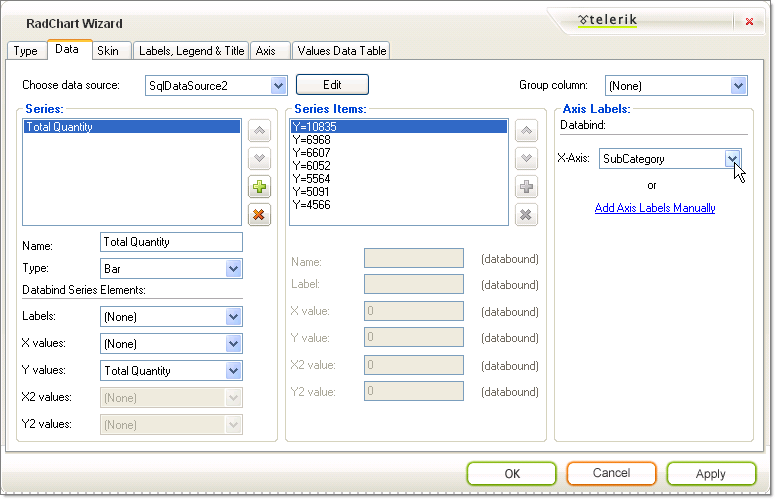 Select "AdventureWorksT" from the Select or enter a database name drop down list. Optionally, you can click the Test Connection button to verify your settings so far. 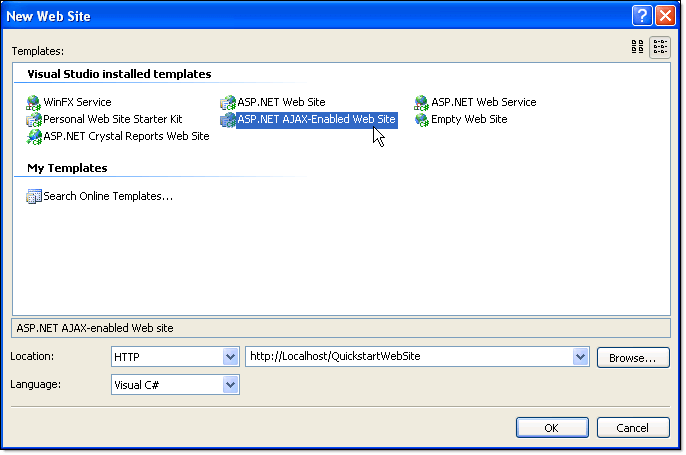 Click the OK button to close the dialog. 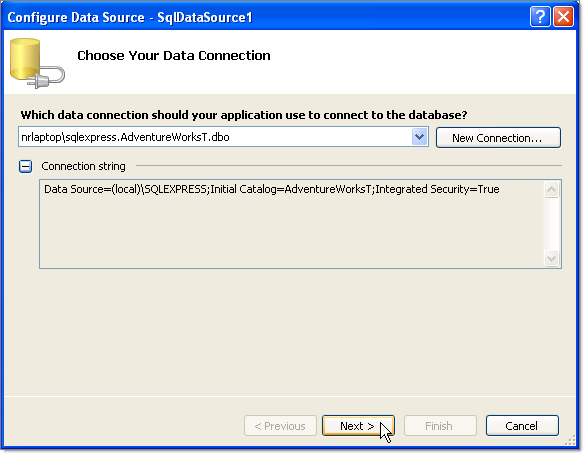 On the Choose Your Data Connection page of the wizard click the Next button. 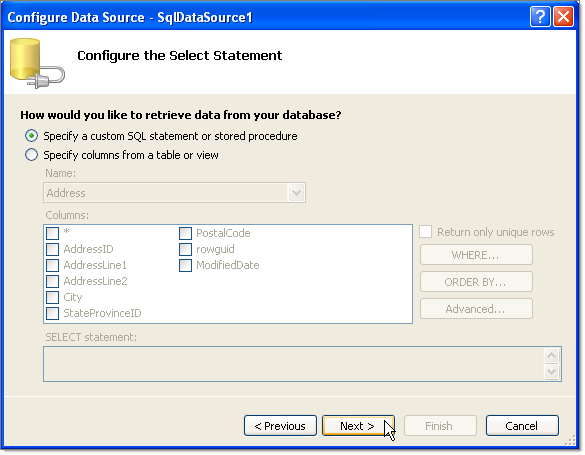 On the Configure the Select Statement click the Specify a custom SQL Statement or stored procedure radio button. Click the Next button. 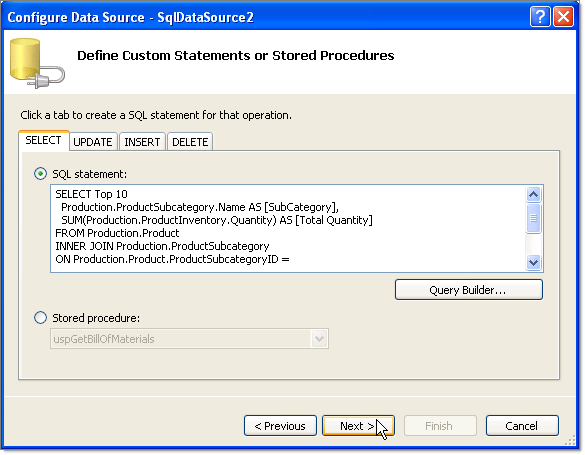 In the Define Custom Statements or Stored Procedures enter the following SQL. 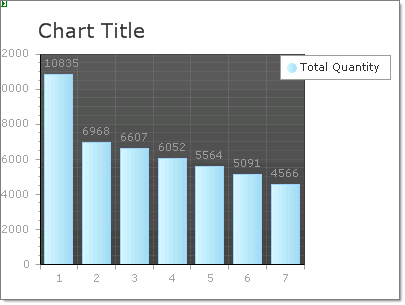 Click the Test Query to see the data that will be displayed in the chart. Click the Finish button to close the wizard. 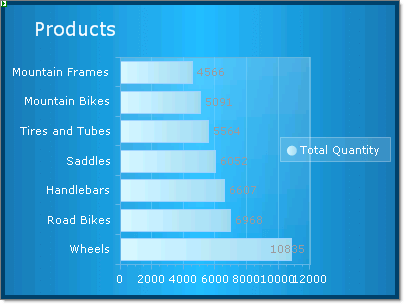 On the RadChart Wizard Data tab Axis Labels choose the "SubCategory" from the X-Axis drop down. 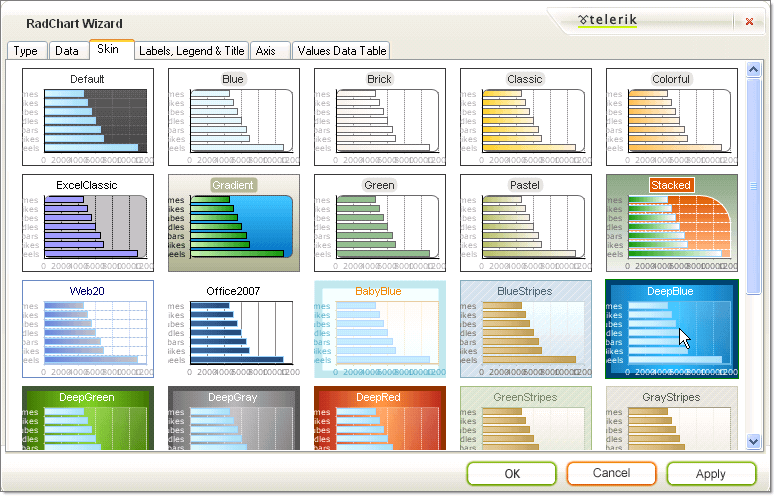 On the RadChart Wizard Skin tab select the "Deep Blue" skin. 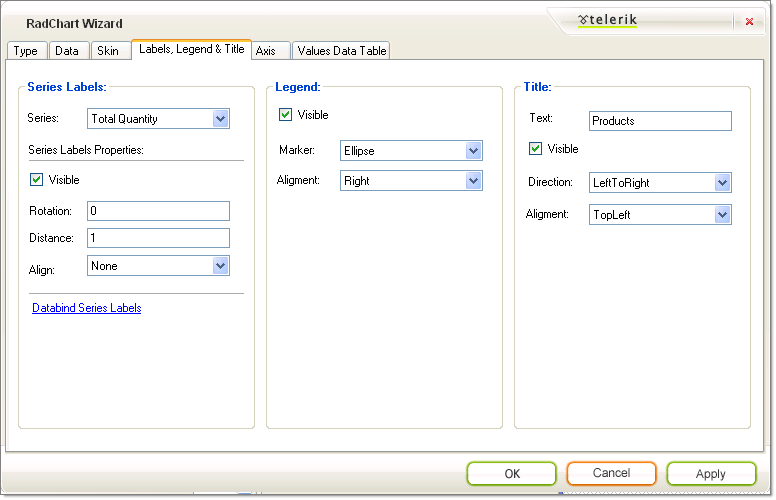 On the RadChart Wizard Labels, Legend and Title set the Legend Alignment to "Right" and Title Text to "Products". 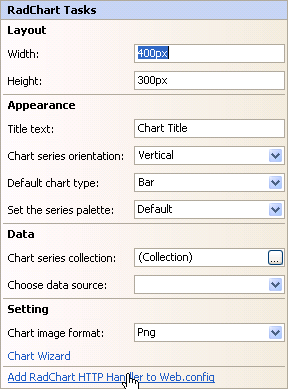 The X-Axis labels bound to the "SubCategory" column are too wide and will overflow. 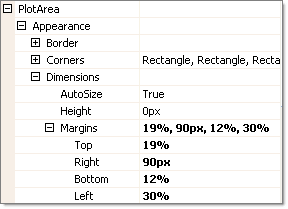 To make the plot area smaller to make room, set the PlotArea.Appearance.Dimensions.Margins.Left to "50%". The finished chart should look like the screenshot below.